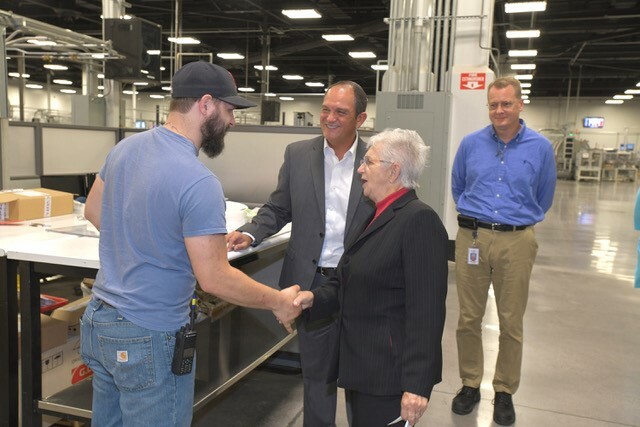 TOBACCOVILLE – Today Rep. Virginia Foxx (R-NC05) toured Tobaccoville Manufacturing of Reynolds American Inc. (RAI). She met with business leaders and employees to hear first-hand how the Tax Cuts and Jobs Act is impacting business practices and workers. Rep. Foxx voted in favor of the Tax Cuts and Jobs Act which became law on December 22, 2017. “RAI and its operating companies thank Congresswoman Foxx for working to protect North Carolina manufacturers and jobs. Comprehensive tax reform benefited the employees and companies in her district and throughout the country. Tax reform put $1,000 directly into the pockets of many working families here in North Carolina when we declared a bonus for our employees and to invest half of the tax savings in potentially reduced risk products in order to further our vision of transforming tobacco,” stated Nancy Hawley, Executive Vice President - Operations of R.J. Reynolds Tobacco Company. Reynolds American Inc. is an indirect, wholly owned subsidiary of British American Tobacco p.l.c., and the U.S. parent company of R.J. Reynolds Tobacco Company; Santa Fe Natural Tobacco Company, Inc.; American Snuff Company, LLC; Niconovum USA, Inc.; Niconovum AB; R.J. Reynolds Vapor Company; and Kentucky BioProcessing, Inc.